But putting aside the entirely context-less hype and fear-mongering of our media and political elites, even if there were some kind of war between the US and North Korea, it would not remotely lead to anything like the "end of the world." The US has thousands of immediately launchable nuclear weapons; North Korea has, er, none. And even if you believe Pyongyang's propaganda (and if you swallow it about their nuclear weapons program, why not believe their BS about the happy workers' paradise they have there? ), you're still left with the fact that North Korea might be able to put a weapon on a missile at some point in the future. OK, then they could possibly lob this missile (or heck, two or three of them, maybe) in the direction of the United States -- which, we assume, would just stand back and watch this happen, despite having North Korea absolutely blanketed with surveillance and having the ability to destroy any launcher the instant it reared skyward. And then North Korea would be obliterated by a US retaliation. So even if this actually impossible worst-case scenario happened, where is the global nuclear conflagration that would destroy the entire world? Is Russia -- the only other country actually capable of destroying a good bit of the world -- going to launch a suicidal nuclear attack on the US because North Korea launched a sneak attack on the US and the US responded? 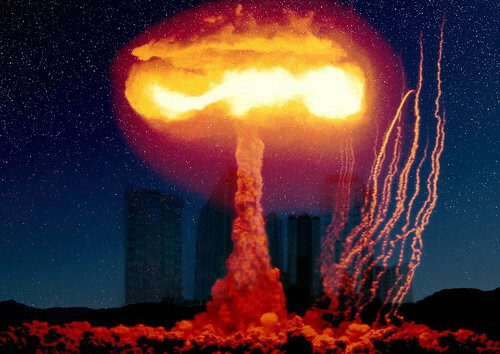 Would China launch its handful of nukes at the US, knowing it would face instant annihilation? Gormless goobers like Donald Trump and John McCain might think so. But Russia and China have already said they themselves would punish North Korea if it launched an unprovoked attack on the US (or anyone else). Thus, even if, God forbid, there was a nuclear exchange between the US and North Korea, the world would not end, human civilization would not collapse, etc, etc. Where would the other missiles, the ones that would destroy the whole world, come from? Are people assuming that if North Korea launched one of the nuclear-armed missiles it doesn't have at the US, the US would then launch its entire nuclear arsenal all over the world in a paroxysm of destruction? This fear-mongering trope makes no actual sense. But is certainly very useful in keeping people cringing and anxious -- and looking to their "leaders" to save them from the weirdo insane crazy animal in North Korea who is somehow going to blow up the entire world all by himself! Oh, Mr. President, we forgive all that Nazi-coddling stuff; just save us from the monster! And what about the aforementioned context of the current crisis? The latest racheting up began, we're told, when North Korea fired a missile over a Japanese island: an act of "unprovoked aggression," it was said. But what else was going on at the same time? Well, a vast "war game" being carried out by the United States, Japan and South Korea right on North Korea's doorstep (and on the Japanese island overflown by the missile). As Mike Whitney points out, these "provocative war games [were] designed to simulate an invasion of North Korea and a "decapitation" operation to remove (i.e., kill) the regime." North Korea had asked the US not to begin the "decapitation" games, or else it would have to respond. Thus the launch of the unarmed missile. Then, as Whitney notes, a few days later US B-1 bombers conducted a "dummy" nuclear bombing run near Seoul. This was followed by North Korea's claim of a successful H-bomb test, and the claim it could mount a nuke on a missile. Now, North Korea is a loathsome, tyrannical regime. It is might even be somewhat worse than Saudi Arabia, the extremely close ally of the US and the UK. (Although women can drive in North Korea, and even hold office.) But you don't have to defend the regime to see that the current crisis is not happening in a vacuum; it is not simply some mystical motiveless malignancy bubbling up from a cauldron of pure, senseless evil. I'm so old I can remember -- way back in the 1990s -- when a landmark agreement was reached with North Korea. In exchange for giving up its nuclear program, the US and its allies would provide help with peaceful nuclear power, food, development -- and would, finally, begin negotiations for a peace treaty that would at last bring the Korean War to an official end. This would allow something more like normal relations to go forward. But in the time-honored Washington fashion (just ask the Native Americans), the US began almost immediately to undermine the agreement. Promised equipment, food and aid was not delivered. North Korea too was being cagey, and every hesitation or unseemly remark on its part was used as an excuse to further "delay" the agreement's implementation. Needless to say, the peace talks -- which were and still are the chief aim of North Korea -- never took place. When George W. Bush took office, he expressed his personal contempt for the grubby little North Koreans and essentially said he wasn't going to deal with such riff-raff anymore. So the agreement died -- and North Korea re-started its nuclear weapons program. So again, the question arises: what is the basis of all this media jabber about "the end of the world"? Forget our noble leaders, who spend most of their time trying to scare us into unquestioning obedience while they pick our pockets; we know what they're up to. But why this sudden and apparently universal adoption of a baseless, empty, dangerous notion by the media? Well, fear sells, of course; you wouldn't get too many clicks with a headline saying "Korean Situation Calls for a Nuanced and Historically Informed Approach Leading to Fruitful and Realistic Negotiations." But it's odd to see the trope picked up and propagated not just by the media bosses but by writers and talkers across the board, even in non-political areas. Who knows where the current crisis will end? Certainly, the bipartisan foreign policy establishment -- which, yes, includes the Trump Administration, as well as the "liberal" media and vast chunks of the "Resistance" -- seems keen on bloodshed in some form or other. Or if --particularly in the liberal quadrants -- they blanche at that, they surely want to see North Korea crushed and humiliated into begging for mercy from the global hegemon. My hunch is that we will see neither -- no US attack on North Korea (and certainly not a nuclear one) and no capitulation by Pyongyang. Trump has no interest in peace, of course, nor in nuance or history, or anything else aside from his own aggrandizement. But he and his family do have lucrative business interests in China, which would be threatened by any overreaction against the thoroughly containable "threat" from North Korea. And at the moment, it seems that the military junta to which he's given power over foreign policy also seems reluctant to start shooting -- although naturally they are happy to keep goosing the fear of attack and the threat of war so the grease and graft will continue to flow into the militarist swamp. But hell is murky, as that noted political strategist Lady Macbeth once said. And in the hell we've made with our -- why not? -- empire burlesque, the outcome of the current imbroglio remains unclear ... except for one key point: it will not end, it cannot end, with the end of the world.